On Friday afternoon, as I sat down to do my nails for that evening's Relay for Life, I was stuck trying to decide what I wanted to do with my manicure. I couldn't pick a shade of purple, the color of Relay. Should I go dark or light? Glittery or creme? And then I could have smacked myself. Duh. DO ALL OF THE ABOVE! 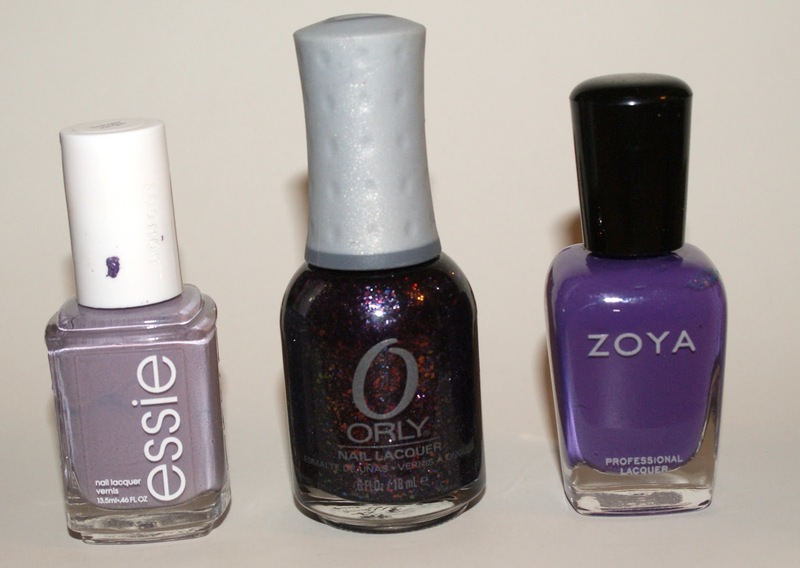 I picked out Essie Bangle Jangle for the light, Orly Fowl play for the dark and glittery (FLAKIESSSSS! 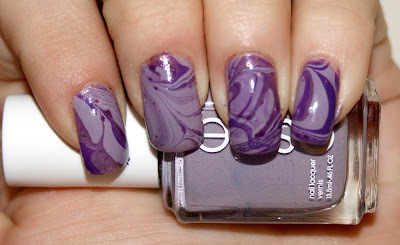 ), and Zoya Mira for the in-between. After doing a quick coat of Bangle Jangle for opacity's sake, I got to work. And this was the end result. I was really happy with it overall. First and foremost, Bangle Jangle was a nail polish dream and applied beautifully. The other colors seemed to play off each other rather nicely and make an impact. My nails were the talk of relay, especially once word got around that they were the reason I was the #2 fundraiser. I was a little upset at the event, truth be told, because in years past, they had recognized the top 3 individual fundraisers and top 3 teams. This year, they only recognized the top individual, while doing all three teams again. My team, the Rutgers University Seeing Eye Puppy Club (hey Pebbles! ), was the top team. And that was awesome. But I was a little sad they skimped out. I really wanted them to mention that I had raised the money in honor of my dad. But at the end of the day, the good of what this money did far outweighed my minor disappointment. It only lasted a few minutes. I just hope that the nearly $80,000 raised overall at the Rutgers event really makes a difference in people's lives. I know a lot of you donated in honor of a loved one lost, currently battling the disease, or a survivor. And I thank you for allowing me to honor them on your behalf that night. It was truly a wonderful experience that I will treasure. Thank you for honoring my father too Danielle. He and my mother both attended Rutgers University and are now gone. My Dad to cancer and my Mom to homicide. Thanks again and I'm glad I was able to contribute and have my Dad be there in spirit while you were running.. It was my pleasure. I'm sorry to hear about your parents. I'm sure they represented their fellow Scarlet Knights, like myself, very well. Proud to know they came before me. Cosmetics for a Cure Raffle: The Winners!